Introduction. Stoichiometry and Kinetics. Homogeneous Reactors. Nonodeal Reactors: Residence Time Distributions. Catalytic Two-Phase Reactors. Catalytic Three-Phase Reactors. Gas-Liquid Reactors. Reactors for Reactive Solids. Toward New Reactor and Reaction Engineering. Chemical Reaction Engineering: Historical Remarks and Future Challenges. Exercises. Solutions to Selected Exercises. Appendices. Index. 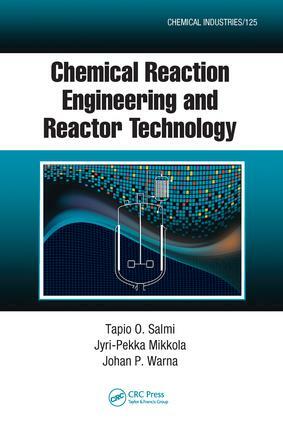 Tapio Salmi is a professor of chemical reaction engineering at Abo Akademi in Abo-Turku, Finland. Jyri-Pekka Mikkola is a professor of industrial chemistry at Umea University in Sweden and Abo Akademi in Abo-Turku, Finland. Johan P. Warnais a professor of chemical reaction engineering at Abo Akademi in Abo-Turku, Finland.